The main Solar Body that is our visible Sun, is undergoing an evolution in that its magnetic pole is reversing, which further alters the solar ray transmissions to the Earth and to other planets in our Solar System. Planet Earth’s local Sun is a star called Sol. Our Sun is a Stargate and it is possible for certain craft to be used to go in and out of the portal to reach the outer rings of the Solar System. Recently, many neighbors in our Solar System became aware of the changes happening with our Sun, as a result of the rebirthing of the Solar Logos in the 10-11-12th dimensional layers. The 4th dimensional Solar Stargate on the earth is located in Giza, Egypt and this is the main opening into the Astral Plane which also opens further into the other Solar Gates. This stargate access is where the trajectory between the Sun, Earth and Moon are interconnected through geometric fields of instruction sets that are based on the grouping of light codes. These may appear as platonic solids, and are the building blocks of matter that arrange the blueprint layers that form into the timelines in the Universal Time Matrix. The Annunaki Hybrid Fallen Angelics had taken control of this area of the planet over 22,000 years ago, in order to gain control over the Sun and Solar Gates. As a result of recent grid wars they have lost control over the Solar Gate through the rebirthing of the Solar Logos for Earth, Tara and Gaia. The Sun is related to activating the human DNA template for spiritual ascension potentials. 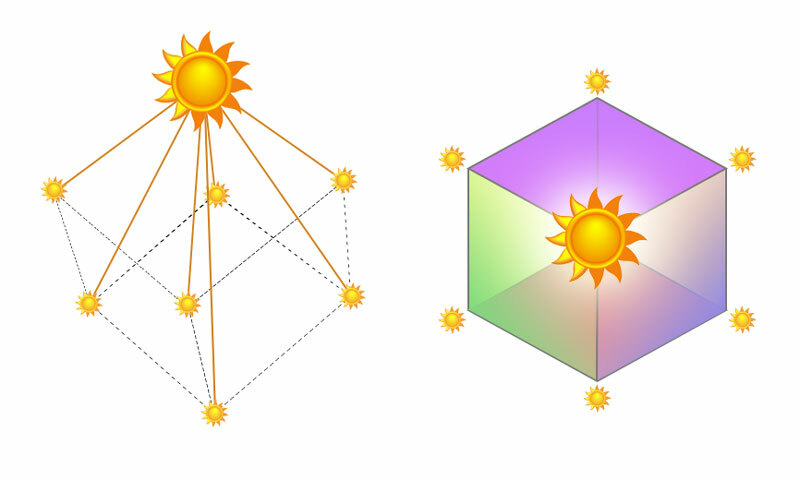 Each Sun and Star in the Universe are interconnected through the instruction sets of the morphogenetic fields, or plasma filaments that create the webbing that interconnects all of the stars and stellar bodies together. There are Seven Sacred Planets which have acted similarly as consciousness prototypes for manifesting creation, as well as supplying the raw materials, light, sound, and electrotonal code for the builders and architects of the planet earth. The Seven Sacred Planets are also comprised of living spiritual light, which circulates throughout and beyond our Solar System, while the other five planets have historically remained spiritually stagnant or dormant in their organizational principle. They have future applications which have yet to reach their evolutionary potential for the solar system. These seven planets are spiritually initiating in order to circulate the combined plasma waves of the Cosmic Spiritual Suns throughout the Solar System. These inhabited planets have human and other life forms, which exist in other timelines and dimensions that are also undergoing stages of the ascension process. One such sacred planet closely related to the earth as a sister planet enduring the ascension process in its higher dimensions, is Venus. Venus is providing to the earth body an transmission for an ascending race prototype for all twelve human tribes, from its original Mother principle. The planet Venus holds the matriarchal history of the Solar Female Christ for the angelic human race. During this phase, the hidden history of the matriarchal lines of the eternal Solar Feminine Christ principle begins to transmit its blueprint from the Holy Mother aspect, and that mother code is gradually restoring energetic balance through the corrected feminine principle which brings gender balance back to the laws of creation. All of these twelve planetoids in our Solar System represent the total energetic body of what remains from our 5D earth in the next harmonic universe. This future earth has been called Terra or Tara and it is also deeply related to the female phantom body of Tiamat, another sister planet that exploded from a cataclysmic war. It is some of these planetary remnants that have produced traumatized and unhealed mental bodies that are the negative source of miasma and karmic superimposition that was exploited upon the 3D earth plane by the refugee races. One such quarantine architecture was installed, the Solar Cross implant was placed in the heart centers of the 4D astral body and the 8D body of the earth and humanity, generating a one way access into the 8th portal of the Orion gateway that housed the Yahweh Matrix. The spiritual stagnation of the inhabitants of multiple planets and their warring mind logos is what combined the strength of the enforcement of the Solar Cross as a dimensional blockage to stop access in and out of this quarantined system, and further limited access by any entities to go beyond the consciousness of the Solar System, unless they are embodied as Solar Consciousness. Black hole entities, moon chain beings are of the lunar consciousness groups, and they are battling to find ways to exit out of the Solar Gates and Solar quarantines, without success. The history of explosion of planetary bodies and the rampant destruction it creates upon the races involved, is why the Solar Cross quarantine was put in place on the Earth, to remove access of lunar and black hole entities beyond our Solar System. This is one reason of what formed a quarantine fence around the earth, as well as another frequency fence that is enforced by the NAA technological nets, of which they are currently retaliating with the another AI control strategy. The repeated explosion of other planets in our Universal Time Matrix is the primary reason why there have been multiple invasion histories upon the earth, these explosions weaken the integrity of the time matrix. These invasions are from many lines of the Fallen Angelic races that are based in lunar or black hole forms. As a result of the invasion histories, there is a tremendous amount of karmic imbalances to play out and resolve between several planetary logos and their race lines that exist in the Solar System. Each of these planets, its astrological blueprint and their race lines are undergoing stages of spiritual evolution through the reabsorption of their main egoic ray that existed within its closed energy system. The main mental body ray produces a theme of consciousness experience for that race line, and the experience never evolves when the consciousness energy is consistently depleted and not organically replenished. This was the consciousness state of the lunar forces, on a one way trajectory of de-evolution towards ever increasing fragmentation. The collective race psychic impression and its ego–personality influencers begin to shift during the Solar System Initiation, plasma rays that are radiating through the Cosmic Spiritual Sun, or through the Solar Consciousness Network. At this time we have begun a Solar System Initiation as a result of the rebirth of the Solar Logos in our Universal Time Matrix, which impacts the interchain of spiritual evolution between multiple planetoid bodies and the related histories of the egoic-personality mental bodies that are attached to those planetary histories, which include the moon chains. These planets, moons and their assorted creations have collectively brought forth their egoic and grotesque astral manifestations by ignoring the natural laws and choosing to abuse technology to dominate and enslave others, many of these moon chain groups have greatly influenced humanity in the lower earth plane to believe in parasitism and blood sacrifice ideologies. The egoic remnants, the psychic debris of these planetoids and the Fallen Angelic entities associated with them, have created vast amounts of mind parasites throughout the phantom realms. This entry was posted in * AGE - OF - AQUARIUS, * End GAME - GOOD vs EVIL, * INFORMATION SOURCES, HEAVEN'S BIRTH CANAL, LISA RENNE - MESSAGES. Bookmark the permalink.